“What I love most about rivers is you can’t step in the same river twice; the water’s always changing, always flowing…” – Judy Kuhn. While the quote is from Disney’s Pocahontas, the sentiment can be applied to life in Meigs County, for, the Ohio River today, isn’t the same Ohio River as it was in years past. 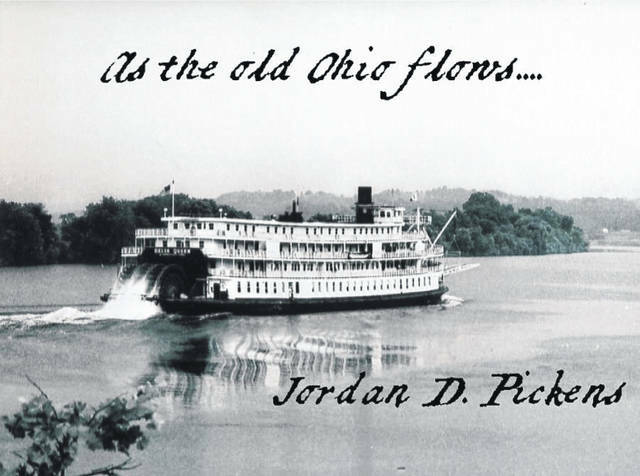 When I decided to do this column, I gave careful thought to a name for it, and I also use the name as sort of my sign off, “as the old Ohio flows….,” for good reason. To me, the name of the title is more than words: it’s a way of life. Each week when I begin to write the upcoming edition of this article, I kick a few ideas around and usually try to cover something I can relate to my kids in American History class at Southern High School. I do this for multiple reasons; one, to incorporate as much local history I can into my American History curriculum; and two, if I can relate the subject matter to them as much as possible, they are more likely to understand it much better. This week, we are discussing industrialization and the movement to urbanization. Mass production at cheaper costs — the bigger the better — and for some reason, I kept thinking of one boat and her former Captains from Pomeroy. The boat I am referring to is SPRAGUE, also known as “Big Mama,” and two of SPRAGUE’s captains were from Meigs County: Capt. 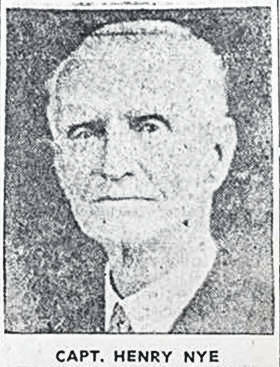 Henry Nye of Pomeroy and Capt. Guy Mallory of Racine. Built in 1901 in Dubuque, Iowa, SPRAGUE was designed, built by, and named after Peter Sprague of Iowa Iron Works and used in the Monongahela River Consolidated Coal and Coke Company. 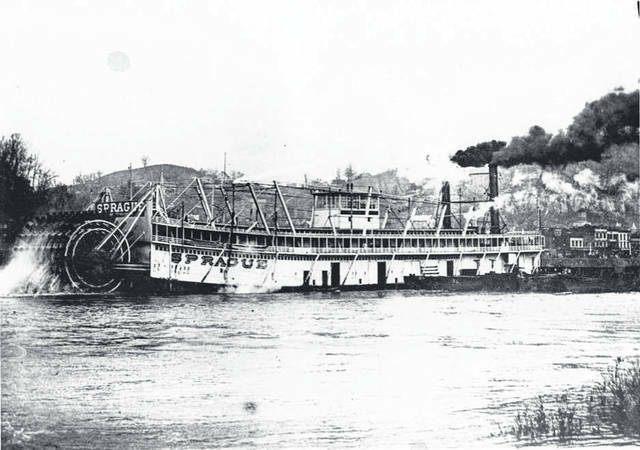 Built at a cost of over $300,000, “Big Mama” SPRAGUE was the largest sternwheel towboat in the world with an overall length of 318 feet and width of 61 feet; her hull was 7.4 feet. Her gigantic paddlewheel was 40 square feet, later shortened to 38 feet to add speed to the boat, with four 20,000 pound rudders surrounding the sternwheel; these rudders each measured 32 feet long and 12 feet high. The rudders were connected to the large wooden 13.5 feet in diameter wheel to steer the boat. Her stacks were 50 feet high from the top of the boilers to the flutes and were 5 feet in diameter. When first built, she had six sets of Hopkins patented boilers built of ¾ inch steel plate and designed for pressure of 200 pounds per square inch. Total weight of her engines was 151,000 pounds. As for horsepower, no one really ever tested her full horsepower, but it was rated around 2,720. According to the October 27, 1934, edition of Waterways Journal, Captain Henry Nye of Pomeroy was pilot of SPRAGUE all but two years of her service in the coal trade for the Combine. Captain Nye and Captain Henry Pawnell, also of Pomeroy, were master pilots of the towboat H.F. FRISBIE on the upper Mississippi River for some years. When the H.F. FRISBIE retired in 1903, Captain Nye went to SPRAGUE. Co-pilots with Captain Nye for some years on SPRAGUE were Captains Cal Blazier and Guy Mallory. Captain Mallory was from Racine. For more information on the SPRAGUE, pick up a copy of Jack Custer’s book The Steamer Sprague (Big Mama): The World’s Largest Sternwheeler Towboat. I would like to thank Robert Titus for photo copies of an April 1956, edition of The Democrat, which gave Meigs County readers the date and time to watch SPRAGUE make her last trip up the Ohio River for Pittsburgh’s bicentennial. You can check out that edition of The Democrat online at the Meigs County Library’s website.